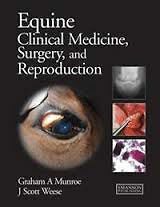 The internationally respected editors and authors have combined their expertise to produce this major new textbook and reference source in a single volume, covering all aspects of equine medicine, surgery and reproduction. The text is supported by a wealth of over 1200 illustrations of the highest quality -- color photographs, radiographic and ultrasound images, and diagrams. The book is system-based and each individual system is introduced with precise information on the relevant basic anatomy and physiology, standard clinical examination techniques and useful differential diagnostic aids. This is followed by diseases and disorders that are pertinent to that system, grouped together either anatomically or based on presenting clinical signs. Each condition is described using consistent headings -- definition/overview, etiology and pathophysiology, clinical presentation, diagnosis, differential diagnoses, management/treatment, and prognosis. Additional chapters deal with the foal, with wounds and behavioral problems.